After a year in which I've read more books than I have in decades, I'm working on my annual round-up posts with ratings and recommendations. But before I get there, I also must confess and refocus. The truth is, I spent a LOT of time reading books this year, from contemporary novels to classic literature to parenting advice to history and biography to spiritual growth. On the upside, that means I spent a lot less time reading blogs and internet drivel. But it also means that I spent a lot less time reading the inspired Word of God. My Scripture intake this year was, to be honest, rather dismal in comparison to my total reading. I can offer some reasoning and excuses. I can beat myself up and wallow in guilt. Or I can repent and receive grace and seek to change that in 2012. As the new year approaches, I am finding encouragement and inspiration in an email from my pastor and in several online articles. The bottom line is that if you fail to plan, you plan to fail! We can read Scripture in a lot of different ways. We can go at a breakneck, finish-in-six-months pace, or we can take several years to get through all 66 books. But we need a plan and some accountability. As our pastor kindly yet firmly challenged us last year: You may say you don't want something so rigid and formal as a Bible reading plan. Ask yourself--how's that working out for you? It didn't work out very well for me this year. So I'm reading the following links and thinking about what kind of plan I want to tackle. I want to get more of the Word in me this year! And I know that's not just going to happen magically if I'm not intentional about immersing myself in it on a regular basis. There are many things we can do with our discretionary time, and I hope that we are willing to prioritize, not out of guilt, but desire to know God more deeply and obey Him more fully this year. ...Yes, there are times when we are dry spiritually and it seems like routine. But we must act in faith believing that by taking in (over time) the whole of Scripture, by the help of the Holy Spirit, God's whole Word will be used to transform our mind. A quick illustration: suppose you decide to go to the gym this year and lose some weight (or gain some strength). Going into the gym for 3 hours every day for one week will not really be helpful. You will not (despite the optical illusions of our mind) see the benefits in a week, or even in months. It is doing the hard and disciplined work over the long haul that we will see and feel the benefits. This is true spiritually. You will not feel great personal benefit every single day, and come out of devotional time with a spiritual "high." But over time, the Word will be worked into the warp and woof of your soul. Without some rudimentary planning you probably won't have anything to eat when you get up in the morning. And without some detailed planning no one can build a house, let alone a skyscraper or shopping mall or city. If producing shelter and food and clothing and transportation is valuable, then planning is valuable. Nothing but the simplest impulses gets accomplished without some forethought which we call a plan. All of us know this and practice it in relation to the basic physical necessities of life. We take steps to see that we have enough to eat and clothes to keep us warm. But do we take our spiritual needs that seriously? Do we apply the same earnestness in planning to maximize our ministry as we do in planning to make a living? Justin Taylor offers a terrifically helpful roundup of Bible Reading Plans for 2012, with lots of ideas and links for your consideration. There are plenty of ways to plan your Scripture reading besides the traditional, familiar plans. You don't even have to plan to get through the whole Bible in a year. Everyone should be able to find something here that suits. If at all possible, read through the Bible using this plan together with other people. Let your prayers for others emerge out of what you read. Don’t choose between praying and reading Scripture—do both! Look for ways in which you can practically live out what you’re reading. So without further ado...make a plan! Get into the Word and get the Word into you! And feel free to share in the comments what has worked for you in the past or what you're planning to do this year. Santa was a big part of my family's Christmas celebrations when I was growing up. I have many sweet memories of family traditions, the ways my parents and extended family conspired to create a little Christmas magic and delight my brother and me. Leaving cookies out; a big ashy footprint on the hearth the next morning; Santa somehow always knowing that we would be at my grandmother's house on Christmas morning rather than at home; never-before-seen wrapping paper that PROVED the gifts weren't from my parents...funny little stories that make me smile. Steve's family didn't do the whole Santa Claus thing, though, so since getting married and having children of our own, we've had to think through and talk about how we want to celebrate Christmas. Will our children know about Santa Claus or receive presents from him? Why? Why not? There are plenty of Christians who embrace Santa Claus traditions, and plenty of others who don't. I'm not interested in getting into a debate. I will say that growing up making a big deal of Santa, I never felt like my parents had lied to me, and I don't remember being confused about what (Who) Christmas was really about. So get your act together! That is not good news for me. That is bad news. The Bible makes it simple though: we all make the naughty list. None is righteous, no, not one (Romans 3:10). That’s bad news. The good news is that, despite our list making tendencies and legalistic leanings, the list was crushed by the babe wrapped in swaddling clothes. He is the only one who made the list. Because he made the list, we are given the gift of him. His righteousness, his perfection, and his “niceness” are bestowed upon us with list-shattering grace. Praise His name! I'm so thankful that even though I have cried and pouted, even though my name is at the top of the naughty list, I receive not a lump of coal but glorious, eternal riches in Christ Jesus! What Should Christian Parents Teach Their Children About Santa Claus? "Though Santa gives gifts based on how good we’ve been all year, the heart of Christian gospel is that we’re given gifts – salvation from sin – because we aren’t good. Unlike the song about Santa, we should never encourage our children to be 'good for goodness sake.' There are, however, redeemable features of the historic person named Saint Nicholas that all Christian parents should teach their children." "When it comes to cultural issues like Santa, Christians have three options: (1) we can reject it, (2) we can receive it, or (3) we can redeem it. Since Santa is so pervasive in our culture, it is nearly impossible to simply reject Santa as part of our annual cultural landscape. Still, as parents we don't feel we can simply receive the entire story of Santa because there is a lot of myth built on top of a true story. "...We tell our kids that he was a real person who did live a long time ago. We also explain how people dress up as Santa and pretend to be him for fun... We explain how, in addition to the actual story of Santa, a lot of other stories have been added so that Santa is a combination of true and make-believe stories." Whatever we do with Santa, let's make sure our children know the REAL good news of Christmas. Let's make sure they know that even though they can't hope to make the "nice" list by their best efforts, the Babe in the manger lived perfectly on their behalf--and He offers them the best gifts of all--the gifts of knowing and being with Him forever. Two particularly thoughtful articles have had me pondering lately in the midst of all the Christmas preparations. It started last year or the year before with this classic post from Ann Voskamp, When Christmas Gets Radical: Whose Birthday Is It Really? In it she shares her family's practice of eschewing gifts for each other, instead choosing to give gifts to the poor worldwide through gift catalogs from Samaritan's Purse, Compassion International and the like. When I first read this, I found it very compelling--and my zeal was renewed when I reread it this year. My heart's desire was to throw off many of the obligatory gift exchanges and give to people who are REALLY in need, rather than get gifts for people who don't need them (or would and could buy it themselves if they wanted it). I wanted to enjoy family time and focus on Jesus and make a big deal of birthdays throughout the year, instead of exchanging Christmas gifts. And to a certain extent we are indeed moving in that direction. We still do lots of giving and receiving with our extended families, but for just the four of us, we've chosen not to do gifts (other than matching PJs for the boys on Christmas Eve). Christmas is the ultimate celebration of the material. Because Christmas is the time when God became man. Word to Flesh. Unfettered spirit to the hazards and joys and stresses of physical life. Think about it. Some people want to filter the material out of Christmas and morph it into some pure ethereal spirit religious day. And some people want to filter all the spiritual out of it and make it simply a holiday celebrating the purchasing power of plastic. But the power of Christmas is when spiritual and material meet. And it always has been. That is the joy of the season, that is the good news, that is the laughter and the paradox and the earth-shaking magic of Christmas. The infinite Word became a physical baby. WHEW. Definitely go read the whole thing. This very unique perspective really challenged me! And while I still find much beauty and truth in Ann's article, I think this one provides a helpful balance for me. I am reminding myself that there are wonderful reasons to give gifts. First of all, just because gifts aren't my or Steve's love language, that doesn't mean they don't speak love very profoundly to some of our friends and family. And second, I have to stop and realize that there is a very real sense in which giving gifts reflects the character of our extravagant God. For the reality is, God constantly lavishes me with far, far more than I need. He gives me generous and wonderful gifts. So when I give gifts to those I love, I am imaging my Heavenly Father to them, imitating the Giver of all good gifts. Just some thoughts as I wrap up my Christmas shopping and prepare for family celebrations. I'd love to hear from you in the comments: How do you handle gift-giving at Christmas? How do you feel about it? I love how the FDA has admitted that BPA is dangerous, and we've recognized that it's enough of a problem that all the baby-product manufacturers make a big deal of advertising that their bottles, sippy cups, etc are BPA-free...yet most canned goods are still loaded with BPA and the FDA isn't doing anything about it. For the record: bisphenol A (BPA) is "an endocrine-disrupting chemical pervasive in our food supply thanks to its use in lining canned goods. Over the years, studies have linked it to breast and prostate cancer, diabetes, obesity, heart disease, reproductive failures and behavioral problems." In the study this article references, participants ate a single serving of canned or fresh soup for five days. And those who ate the canned soup had 1,221 percent higher levels of BPA. I want to scream when I think about the unbelievable things our government wastes time regulating, and then things like this that they simply ignore. “When we instruct children in academic subjects at too early an age, we miseducate them; we put them at risk for short-term stress and long-term personality damage for no useful purpose. There is no evidence that such early instruction has lasting benefits, and considerable evidence that it can do lasting harm." "Infants and toddlers have much more valuable things to be doing with their time: finger painting, running in circles, jumping on couches, pot-and-pan beating, and annoying their siblings (to name just a few). Children, especially at this young age, learn through everything they do. Playing with dirt and water inspires scientific discovery and dipping their fingers in yogurt to smear across the freshly washed table motivates undeveloped artists. There will be plenty of time for them to learn i before e, except after c when they are sitting in school desks for the next seventeen plus years of their lives." "Over the years I have heard many of these forced apologies. I understand the parent’s need for them, but I have to admit they always make me squirm. To truly apologize requires empathy, and empathy develops in its own way and time, at a different pace for each child. So, often the child is not developmentally ready to understand, much less own the words she’s saying. "What worries me most is the child who, because his caregiver has pushed him to always say ‘sorry,’ receives the message that apologizing fixes everything. He punches another child, but as long as he says, “I’m sorry,“ he’s excused and can move on, or even do it again. We are wrong to believe we teach empathy by forcing an insincere apology." I finally realized why my blogging always comes to a screeching halt in December after NaBloPoMo each year. How is it that I manage to post every day for 30 days, then completely stop posting except for gratitude lists? It's because my online time in December gets consumed by Christmas shopping. I do about 95% of my shopping online--so time spent sitting here is easily eaten up with browsing and spending money. Frankly I would much rather be blogging! Shop through Ebates and get cash back for your purchases--it costs you nothing, just gets you free money! The Children's Place is having free shipping and 25% off everything today--combined with clearance prices, that gets me things like fleece sweatshirts for $5. 2518. Christ not only being the Word made flesh or the Suffering Savior but the Reigning KING! 2522. the virgin who bore a Son named Emmanuel: God WITH us! 2525. He shall reign forever and ever! Sigh. Isn't this what always happens after NaBloPoMo? Amazing how quickly I can go from posting every day, to only posting gratitude lists on Mondays. gray sky, bare branches. I was just looking at the starkness of it all earlier this morning and wondering where the year went. I know that's so cliched, but it seriously feels like I was *just* marveling at the beauty of the color green, and *just* complaining about the mosquitoes holding us hostage, and *just* enjoying all the reds and oranges and yellows in the trees. I feel like I'm in a time warp--even the days don't seem all that long here lately. that I really need to get a move on with my Christmas shopping, seeing that it's December 9 and I pretty much haven't really started. OY. simultaneous naps. Jude seems to have finally settled into a more predictable nap routine, and oh how I cherish both the one-on-one time with Elijah in the mornings, and these quiet afternoons by myself. I haven't been cooking much this week--needing to use up what's in the freezer! Though I did turn out 2.5 quarts of homemade chicken stock the other night. jeans, a gray nursing tank top and a blue zip-up fleece sweatshirt. ornaments for our Jesse Tree. to go take a shower as soon as I finish this post. I'm kinda gross. Just keepin' it real around here. a bunch of different things, as usual. Recently finished The Immortal Life of Henrietta Lacks and Baptism: Three Views. Now mainly in Tim Keller's newest book, The Meaning of Marriage, as well as The Omnivore's Dilemma, plus picking up Come, Thou Long-Expected Jesus for daily readings in the mornings. In the car I'm on the third Harry Potter book, Harry Potter and the Prisoner of Azkaban. Really enjoying those more than I expected I would! Bible-wise, I've returned to Hosea, an old favorite book, prompted by a recent conversation. to get back on track with both Bible memorization and exercising in January. Both were fantastic for the first four months of this year, and then slid into oblivion. Christmas music! I have a pretty strict "no Christmas music until after Thanksgiving" policy, but once Thanksgiving is over, it's playing 24/7 at our house. the glow of Christmas lights behind me...we put the tree up in the office this year so as to keep it away from the Destroyer Baby and save my sanity :) We rushed to get our tree up right after we got home from Ohio after Thanksgiving, but we didn't bother to get out any other decorations. My mantel feels very bare without the lighted garland on it! But I am loving the little lighted tree we bought (half off at Hobby Lobby!) for a Jesse Tree, which is sitting on the piano in the dining room. getting fire department patches in the mail in December. My brother, who's a firefighter, collects them, and so a few years ago as a unique Christmas gift, I set out to get him a patch from all 50 states. I write ten letters a year, asking the capital city's fire department to send me a patch. The response has really been amazing. Last year was the worst, with only 4 out of 10 sending one, but we've bounced back this year--I contacted the last nine and have already received five patches--three just today! Seeing those SASEs in the mailbox puts a smile on my face--it has really become a fun Christmas tradition. Steve emailed me earlier today and proposed 8-corner pizza from Jet's and and a movie (The Help just came out on DVD) for tonight--yay! Tomorrow some friends from church have unbelievably graciously offered "Parents' Day Out" for anyone who wants to drop their kids off and go shopping, have a date, etc., so I will probably be taking the boys over there for a few hours and going out by myself while Steve gets some projects done without interruptions. Then on Sunday night we're going to a sing-along concert of highlights from Messiah. Can't wait! 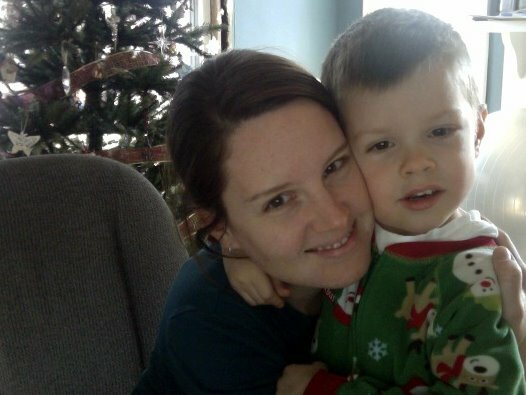 Elijah and I messed around with the webcam last week--Mom and I were finding Photobooth hilarious, but he was a little freaked out by the way it was distorting our faces. So we took a couple of regular pictures. Love my big boy and his footie PJs! Jude doesn't feel good. I have no way of knowing what exactly is wrong with him. He's probably going to wake up and need me several times between now and tomorrow morning. It is what it is. My job, rather than to calculate and recalculate how many hours of sleep I'm not getting and throw myself a pity party, is to love my son...to extend to him the patience and compassion I have been shown my whole life...to give thanks that I have a little boy who needs me and is comforted by my touch...to praise God for the privilege of motherhood and the little trials that force me to die to self. I am finding that when I accept what *is* without focusing so much on what “should” be or what I wish was, our house (and my heart) is a lot more peaceful. Isn't that so true???! If only I could actually remember it, in the midst of trying parenting moments! I can spend my time fuming about the things that go wrong. I can internally grumble and complain about all the parts of my life that aren't fun and all the things I'd rather be doing. I can shame my kids, use harsh words, display my resentment and damage our relationship. Or I can accept what is. I can deal with what comes each day, not what I wish would come or what some artificial ideal in my head says *should* come. I can trust that God has ordained all things, even this, for my good and for His glory. And I can ask Him for the grace to respond to what IS in a way that honors Him and serves my family. Amy Carmichael, a missionary who cared for orphans in India for 55 years, said it best when she wrote, "In acceptance lieth peace." I've found in my life that acceptance is everything. When trials come, I tend to go into fight mode. As Paul prayed for God to take his thorn away, I cry out over and over for God to take my trials away. God has responded to me the same way He responded to Paul: "My grace is sufficient for you, for my power is made perfect in weakness." So these days, while I still pray that God would do something supernatural in many of my circumstances, I also pray for the strength and patience to endure whatever He allows to come my way. I pray for joy, acceptance and contentment in everything I experience. I pray He would grow me to the point where I will truly consider my trials to be opportunities for joy. Great stuff. Praying today that I will have eyes to see the beauty around me, a mind to know that God is present regardless of how I feel, and a heart to trust Him, choose gratitude, and rest in Him as I face what He has ordained. "Then one of them, when he saw that he was healed, turned back, praising God with a loud voice; and he fell on his face at Jesus' feet, giving him thanks" (Luke 17:15-16). You can imagine that all the lepers felt incredibly glad to be healed. Presumably they continued on toward the temple to offer sacrifices and even celebrate. But this one didn't just have a generic sort of gladness or gratitude. He ran back to Jesus and gave HIM thanks. And as a result, he was more than just physically healed--Jesus told him that his faith had "made him well"--had "saved" him. I felt convicted as I thought about all this. Once you're in the habit, keeping a list of gifts is pretty easy. But there's a world of difference between a generic "counting your blessings," the world's brand of thankfulness, and a specific, personal thanks to God through Christ. Am I just thankful? Or am I thanking Him? Am I so absorbed with the gifts that I overlook the Giver? We are very glad to be home tonight after a wonderful week up in Ohio with our families. Can you believe I am on the ball enough to throw up a couple of brand-new photos to continue my NaBloPoMo streak? Over the weekend I got a couple of fun babywearing shots. Jude didn't get worn as much this week as he usually does, but it was kind of interesting to notice that he seemed to miss it. On Thanksgiving Day he was a bit of a wreck for most of the morning. Steve and I both ended up wearing him quite a bit that afternoon, and later in the day he was absolutely content. It occurred to me that he's used to being on my back almost every day, and he hadn't been all week. I wouldn't be surprised if he was out of sorts because he just needed to reconnect and be close. I honestly do not know what I would do without my baby carrier(s)! "everything is about Jesus. Not only was Jesus the focus of all their understanding of Scripture, he was also the way of change—all true change goes through him. Over the course of a few months in your home, would a bystander observe that you are talking about a person or talking about rules that seem unrelated to a person? "I do not expect them to conform to me–I let them be who they are at this season of life and I have adjusted my own age expectations to enjoy and really delight in who they are at every stage. It has brought me much pleasure. But I had to give up a little of my selfish self to enter their world. And so did God, and became Jesus. "...Discipleship is always an issue of relationship. It is not about curriculum, church attendance, rules, indoctrination, but always about reaching the heart." I really appreciated the honesty and the gentle rebuke of this post. Bloggers don't always have it together as much as they appear. And when we strive to do wonderful things for our families, be it cooking or organizing or saving money, we're not really serving them if we're not loving them in the process. I will never, ever understand the phenomenon of Black Friday. You could not pay me enough to go shopping today. Well, OK, I probably would do it for a very large sum of money. But I would not enjoy it. I'd rather shop online any day...and so on this epic shopping day I'll at least give you two quick leads on great products that would make excellent Christmas gifts. Love, love, love this stuff. Given that I'm putting it on my mouth, I like using something with all-natural ingredients! It's also silky-smooth and not sticky, and the scents/flavors are totally yummy. I can personally vouch for lime, coffee, and coconut--but there are several more I want to try! I used some birthday money earlier this year to buy something I'd had my eye on for quite a while--a camera strap cover. Besides being totally cute, the covers make wearing your camera a little more comfortable. And most importantly, they give me a place to stash my lens cap, which I am forever misplacing! I ended up ordering two because I couldn't decide on fabric--the black and white damask/bright minky I originally thought I wanted, and this pink and brown floral one I fell in love with at the last minute. A Diva and 3 Dudes Design also has excellent prices and cute fabrics--I would have ordered from her if I hadn't waited too long to get the striped fabric I liked (it was sold out). I just noticed while composing this that Pickleberry Lane is also having a 20% off sale for Black Friday/Cyber Monday--other stores might be doing the same, so check it out! I also love food stuff -- hearing what works for you, good recipes, tips, etc. I'm particularly on the hunt for good slow-cooker recipes these days, so if you've got any of those, please share! My first tip is to cook for a crowd. When I was first married, someone gave me a subscription to Taste of Home's Cooking for Two. I've got some great recipes I still use from that magazine, but honestly? I think cooking for two is a stupid idea. All that work, and all that mess, for two portions--no leftovers, even? Good grief! I regularly cook for about 4-6 people (at least), because we eat leftovers for lunch almost exclusively. It's quick and easy, not to mention healthier a lot of the time. But last year when I was pregnant with Jude, I discovered the joys of freezer cooking. And oh my goodness, why didn't I do this before?! Of course, it only works if you have the freezer space, and we just got a stand-alone freezer for this very purpose a few months before Jude was born. But really, it's life-changing. Anytime I'm making something that will freeze well, I double the recipe. It's so much easier to make a bigger batch once than to go to all the trouble and deal with all the cleanup two separate times! Some of my recipes are already big, so I don't have to double them--I'll just make half again as much, or make the regular batch and freeze half, only saving enough for us to eat it leftover once (which is nice because then we're not totally sick of it by the time we eat the leftovers three times). Soups freeze particularly well, and if you freeze them flat in ziploc bags, they stack and thaw nicely. For dishes like lasagna or enchiladas, I line a glass pan with foil and freeze the unbaked dish just long enough for the food to be solid--then I pop it out of the glass pan and put the foil-wrapped food in a ziploc bag. When I want to bake it, I take it out of the bag and put the food + foil back in the glass pan to thaw in the fridge and then bake. Similarly for meatloaf, I put it on a cookie sheet and freeze it, then pop it off the sheet and put it in a bag. I also freeze partial meals or ingredients. For example, I'll mix up all the ingredients for tuna noodle casserole except the noodles--so then all I have to do is boil some noodles and mix it all together, very simplified. Or I'll cook a huge crockpot full of dried beans and freeze them in one-can portions. I cook whole chickens and shred the meat, then freeze it (flat--it thaws much more quickly) in about one-pound portions, and I brown about 5-6 pounds of ground beef at a time and freeze it (again, flat!) in one-pound portions. Doing this makes taco night or spaghetti night a breeze, because all I have to do is add seasoning or sauce. My other tip for freezer use is to keep an inventory. I typed up a list of things I commonly have in my freezer, organized by category, with extra spaces to write in other items. I then slipped the lists in plastic page protectors and taped them to the top of our chest freezer. I also taped a wet-erase marker to a string next to the list. I can tell at a glance what's in my freezer, so that things don't get buried and forgotten. It also helps me to plan ahead (I've only got one bag of beans left, so I need to add them to my grocery list and cook some more). Having the list taped to the lid and having the marker right there helps me not forget to add or erase things when I get into the freezer--otherwise this system totally doesn't work. (I have problems making it work for my upstairs freezer, which I'm in and out of a lot more often.) I still have to empty and re-inventory/reorganize the freezer about once or twice a year, but keeping an ongoing list helps immensely. I'm so glad I've discovered all these tips and tricks for cooking in bulk and using my freezer! It was absolutely wonderful when I was newly postpartum. But even without a newborn in the house, it's a lifesaver. I love to cook, but with two little boys, life happens and it's sometimes hard to get a good meal on the table. Having pre-made food in my freezer means I have [healthier and cheaper] options besides take-out for those days when everything seems to fall apart, or when I know I'm going to be gone all day, or when I just don't feel like cooking. And it just plain makes life easier to make twice the food for the same amount of prep time and cleanup! How has freezer cooking worked for you? My husband and I have a 7 week old, so I'd love to know some of your tips for budgeting in order to stay at home. Thanksgiving week seems an appropriate time to talk about this--because when I stop to think about our financial situation, the primary thing I have to feel is gratitude. Steve provides more than enough for our family to live on, so I have the freedom to care for our boys and our home full-time. I recognize that my ability to be at home is a privilege, and the relative ease with which we can make that work is a blessing I don't take for granted. Really, I feel like the last qualified person to write a post like this, because so much of where we are financially has nothing to do with anything we have done right. Steve and I were set up for success in some huge ways that were out of our control. We don't deserve any of what's been handed to us! Both sets of our parents are wise and generous, having both instilled smart financial principles in us and given lavish gifts to us. I received a scholarship to college, leaving me with no school loans. My husband has a terrific job at a solid company. Did we work hard in school? Does Steve work hard to earn his pay? Sure. But even this is grace: God gave me the mind to be able to excel academically, and put me in a family where education was valued and emphasized. God gave Steve the same, as well as a skill set that just happens to be in a field that pays relatively well. We can't take the credit--it is all GRACE. So I recognize that any advice I can give is coming from a place of privilege. We aren't wealthy, but we got a wonderful "head start"--and all we can do is humbly give thanks and seek to be good stewards of what we've been given. PERSPECTIVE. You can be Eve, turning your attention away from all that you've been given to focus on the one thing you lack. There will always, always be people who have things you don't have. Or you can look at all the people who don't have what you have. If you make more than $2/day, you are already richer than half the world! There's a real sense in which you really have nothing; it all belongs to God. And then in another sense, you have everything, because you are His heir! He has merely entrusted money and possessions to you temporarily, to use wisely, for His glory. So give generously and with your eyes on eternity. FORESIGHT. Though this is too late for the original commenter, it may be useful to younger readers. If the idea of staying home with children is even a possibility down the road, I would highly recommend that you and your husband never get used to living on two incomes. Steve and I agreed from the start that if I worked before we had kids, we would not use my income as part of regular living expenses. Adjusting to the expenses and altered lifestyle of a baby is hard enough without also having your budget drastically reduced! Use the second income to build an emergency fund, or invest for retirement or college, or pay off debt--but don't use it to support a high standard of living you can't sustain on only one income. And for the single ladies: Think twice before accumulating debt during your single years. Avoid it whenever possible! Even school loans may have a dramatic impact on your future family long-term. I'm not saying you should never take out loans for college. I *am* saying that you should consider this carefully, recognizing that your debt will be a burden to your family, if you get married, and may even hinder your ability to stay home. SACRIFICE. All things considered, we live very comfortably--you can hardly call our lifestyle "sacrificial." But we do have to prioritize in order to live and give as we do. Every family's priorities are different, so the things we go without may seem like necessities for others, and vice versa. But I'd guess that in almost any family, you can find some ways to scale back and give up things you don't *really* need in order to allocate funds elsewhere. For example, we don't have TV. We have basic cell phone plans, without data or unlimited texting. We drive higher-mileage cars; we have old, hand-me-down furniture. We don't go out very often. These things are minor, but they add up. Two other quick tips worth mentioning: One key part of our budget is "discretionary money." Steve and I each get a little money out of every paycheck that is ours to spend, no questions asked. Anything extra we want, whether it's coffee at Starbucks, a new book for Kindle, clothes or shoes, whatever, comes out of that money. If I want something big, I have to save up; when it's gone, it's gone. I think this has really helped me to curb unnecessary spending. And then, learn to cook. We very, very rarely eat out. I think our food budget is actually pretty high because of the way we choose to eat, but it doesn't have to be. You can save a lot of money, even if you're not into "extreme couponing," just by eating at home. Cook for 4-6 instead of two, and eat leftovers for lunch. Buy foods in bulk where possible; cook from scratch instead of buying processed ingredients. Not only can you trim your food budget this way, but you will also likely see long-term savings in your health care costs. So, that's my two cents on finances and staying at home. What do the rest of my readers think? Weigh in below with your own advice and experiences about managing your money (as well as your favorite websites for budgeting or money-saving tips). I was honored to be asked recently to write a guest post for one of my newest favorite blogs: Christ in the Chaos (formerly known as Life with Littles). Kimm is a woman who loves and breathes the gospel--and who graciously lets us read along and be encouraged as she preaches it to herself in the midst of everyday motherhood! I can't tell you how many times I've printed off posts or copied quotes just in the few short months I've been reading. This is definitely a blog to add to your feed reader--or you can follow her on Facebook. Motherhood has laid me low like nothing else. 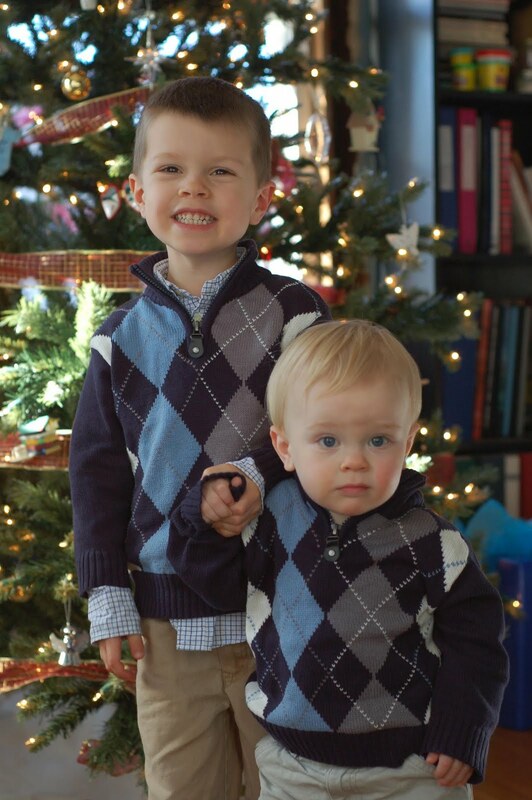 Over the last four years, God has used two precious little boys to humble me to the dust, to expose just how "false and full of sin I am," just how inadequate and helpless and dependent I am, no matter how much I might wish otherwise. I have, to be totally honest, hated it at times for that very reason. I don't like being brought face to face with the reality of what a mess I am, what a failure I am and how totally I screw up all the time. So when I am full of despair at how little I have grown and changed in the last four years…when I am embarrassed by my children’s behavior or fearful of how other moms are judging me…I have only one place to go. As I enjoy Sunday family time, a couple of quick snapshots of my boys--Ten on Ten provided me with some photos that didn't make the cut, but which I still very much enjoyed. Elijah is SO hard to photograph these days--he either refuses to look at the camera, or makes a very fake cheesy grin. I captured this shot while he was enjoying one of his favorite pastimes: crawling around on the floor with Jude. Another shot from the impromptu changing table photo shoot. Tell me, is there anything cuter than baby toes? We are blessed to have a nice park close to our home and the boys love swinging. Elijah is working up to the big swings, but for now prefers the baby swings since he can go so much higher when he feels more secure. Just in time for Christmas! I have always enjoyed Janelle Mahaney Bradshaw's photography, featured at GirlTalk--now she has opened an online shop where you can purchase artwork. I am going to have to do a little browsing as soon as I get a few minutes (like when NaBloPoMo is over!). Another shopping tip for the journaler in your life--I saw this site advertised in a magazine, and I haven't had a chance to check it out yet, but it looks promising: you can choose size, cover image, and paper type to customize these handmade journals. I really love Paper Coterie's products, and I'm intrigued to participate in a photography challenge they're hosting called "Picture the Holidays." I don't know much about it, but I've signed up and am looking forward to prompts that will help me slow down, pay attention, and take more photos (along the lines of 10 on 10). Wanna join me? I made it over halfway through NaBloPoMo before getting to the "it's the end of the day and I'm tired and I haven't written a blog post yet but I don't want to lose the challenge" post :) That's allowed once, right? ...but for tonight, I don't have the mental energy to bring any of them to completion. Instead I'll leave you with questions--what's your favorite type of post I write? What would you like to see me write about during the rest of the month? Remembering to Praise: Happy Birthday, Jude! Most days I forget to praise. I named him Jude so I would remember, so I would fight for joy and choose to say, "This time, I will praise the LORD." But the days are still long and mothering small children still exposes all my rough edges, all the dark and ugly parts of my selfish heart that resist this never-ending call to lay down and die. I say it a hundred times a day--"Jude!" [Praise!] --but still I forget. So I make lists. I read books and blogs and articles, and I write my own so I'll hear the words I so easily forget. I do this to remind myself that I have countless reasons to praise the LORD, from the Incarnation and the Cross to the Resurrection and my own adoption and redemption. And for the last year thirteen months, I have had a million more reasons to praise, if I will just wake up and pay attention to this beautiful little boy. Jude came into our lives in a way that was an answer to many prayers and an occasion for much praise. Over the months that followed, I have felt overwhelmed by many struggles, but I have also experienced much grace. Nursing, despite all my expectations and hopes that it had to be better the second time around (surely experience had to count for something), was a total nightmare for about eight weeks. But by grace, I persevered--my boy grew chubby thighs on my milk alone--and at thirteen months, he signs "milk" while he's nursing and flashes me a gap-toothed grin that melts my heart. Sleep? Overrated, Jude says. I'm not my big brother; I don't need twelve hours a night plus naps (yes, I was ridiculously spoiled by Elijah). But I have a husband who helps with the middle-of-the-night parenting. I get a lot more sleep now than I did a year ago. And in the early morning hours, when my quiet time has been interrupted and I've had to go rescue a pajama-footed towhead from his crib earlier than I would prefer, he sits in the middle of the floor and tosses every (unfolded--I'm not usually stupid enough to leave the folded loads within his reach) piece of laundry across the floor, and giggles. Mealtimes? A chore, I'm not gonna lie. I delay solids as long as possible because exclusive breastfeeding is easier, faster, more convenient, less messy, and free. I dread this stage, when pickiness abounds and he's not old enough to be reasoned with. But, hello First World problem! I have food to feed my child! Lots of it! A wide variety, and it's got plenty of calories and nutrients, and he can, in fact, consume it and digest it! Also he looks hilarious with black beans smeared all over his face. When I stop and slow down and think, I have to "who gets the last word" myself. The newborn stage still isn't my favorite. The years may be short, but the days are long. BUT the years are short! I have a healthy, happy little boy (two actually!). God has chosen an incredibly kind way of refining me. I am forgetful, but He remembers me and He reminds me. He has set before me a monumental task, for which I am weak and inadequate, but He walks with me, He fills me, and He demonstrates His power and sufficiency through me. A year ago, among my many fears, I wondered whether I would slog through the darkness of postpartum depression again. I am overcome with gratitude when I sit here and realize how my Father has protected and preserved me. There have been dark days. I have felt discouraged and full of despair. But I have been *present* this year. I have been more able to enjoy Jude's babyhood. And however haltingly, however infrequently, however weakly--I have been able to praise. Happy (belated) birthday, sweet baby Jude. Today, I am praising God that you're ours. Usually waiting is a process to be dreaded, avoided, or endured. Who among us likes to wait for what she doesn't have but earnestly desires? But this fall, I am very much looking forward to a season of waiting. Over the last several years, I've read all kinds of beautiful ideas for celebrating Advent and building Christ-centered traditions in the weeks leading up to Christmas. It seems, though, that every year Advent sneaks up on me. I don't think much about Christmas at all until after Thanksgiving is over--and then Advent is already underway and I don't manage to do much of anything different or special. This year, now that Elijah is old enough to begin to understand and participate in some special celebrations, I am looking ahead and making plans for "celebrating waiting" during Advent. I want to spend the weeks between Thanksgiving and Christmas helping my family focus on Jesus and building excitement about His coming to earth! The most significant thing I'm anticipating this year is doing a Jesse Tree. If you've never heard the term, a Jesse Tree is a special kind of Advent calendar that tells the grand story of God's plan of redemption, from Creation all the way through the Old Testament to the birth of Jesus. The concept comes from Isaiah 11, where God promises His people that He will bring "a shoot from the stump of Jesse, and a branch from his roots shall bear fruit" (v. 1). Each day of Advent, you read a story from the Old Testament and look for Christ in that story, adding an ornament to your Jesse Tree to represent a prophecy or an ancestor in the lineage of Christ. I've downloaded and printed Ann Voskamp's Jesse Tree devotional, and just this afternoon I went shopping to purchase a small tree and begin collecting ornaments. The devotional, which can be downloaded for free, includes color pictures that you can cut out and mount on cardstock for simple ornaments, but I like the idea of using three-dimensional objects instead. I've gotten ideas and inspiration for this from Passionate Homemaking and Rocks in My Dryer. You can get as fancy or as simple as you like--and you can build your collection over the years, rather than having everything "just so" right away the first year. My wonderfully talented husband recently finished making an Advent wreath modeled after this beautiful one designed and made by Ann Voskamp's son (available for purchase on the website). It is gorgeous! ~I've heard great things about Nancy Guthrie's collection of Christmas readings, entitled Come, Thou Long-Expected Jesus: Experiencing the Peace and Promise of Christmas. I bought it last year but only got to read a couple of the essays, so I hope to make it through the whole book this year. ~One of my favorite Advent traditions, ever since discovering them four or five years ago, is reading through some of John Piper's Advent poems. I've attempted to write poetry in strict meter and rhyme only enough to know that it's very, very difficult to do well. Piper has (in my opinion) an extraordinary gift for it. Not only is the poetry beautiful, but his "imaginative reconstructions behind figures of the Bible" are amazing. Every year I am moved and awed by the way he points to Christ and the glory of God in these poems. I don't believe he writes new ones anymore, but the 25-year archive of past Advent poems is available at Desiring God's website. I highly recommend listening, not just reading. ~I hope to revisit Noel Piper's excellent book Treasuring God in Our Traditions soon--it's been several years since I first read it, but I know it had some wonderful ideas for meaningful Christmas celebrations. The phrase that comes out of my mouth more than any other these days (with the possible exception of "Gentle! You need to be kind to Jude!") is "Try again. You may not speak to Mama that way." The four-year-old in our house is learning and testing the power of words, which means we're experiencing a lot of screaming and yelling, a lot of arguing, a lot of rude comments and demanding instead of requesting. It's aggravating, to say the least. So I spend a majority of my day correcting and scripting. But the tone of that correction varies dramatically--and I felt convicted about that last week when I read some insights from Tim Keller's book King's Cross. "James and John say, 'Teacher, we want you to do for us whatever we ask.' That's a great way to start a prayer, don't you think? 'Oh Lord, I have a humble request, and I want you to do exactly what I say.' Jesus puts up with them graciously--that's the way he was. 'What do you want me to do?' he asks. He doesn't say, 'Um, would you care to start over?' Or 'How dare you talk to me like that? Don't you know who I am? Don't you know who you are?' He simply says, 'What do you want?'" Now, obviously I need to correct Elijah when he speaks disrespectfully. My job as his mother is to teach him how to express his desires and emotions appropriately, without rudeness or screaming/whining. But there is a world of difference between a calm, matter-of-fact "You may not speak to me that way. Try again," and an angry, indignant "You may NOT speak to me that way!! TRY AGAIN!" I can (should--must!) correct and teach Elijah without getting personally offended and outraged. The difference between Jesus and James/John was infinitely greater than the difference between me and Elijah! While Elijah is instructed to obey and honor me as his mother, I am more like him than not. We stand as peers before the holy God. And I am not inherently worthy of respect and honor in the way that Jesus is. So if He can respond patiently to James and John's (and my own!) ridiculous arrogance and petulant demands, how much more do I need to display that same patience as I interact with my four-year-old son (who IS a child, not just acting like one)? Oh, how thankful I am for the way God is slow to anger, infinitely patient, abounding in love and compassion toward me. And oh, how I need His grace as a mother to enable me to reflect those qualities to my impressionable sons.